Software defined storage for traditional workloads like database, email and ERP systems as well as new-gen workloads like analytic, mobile, Big Data, cloud and Cognitive business. Capabilities needed for primary data as well as backup or archive copies. Access via block, file and object protocols. Operating on heterogeneous storage hardware from most any vendor – traditional SAN storage infrastructure as well as newer scale out infrastructure with storage-rich servers. …all nicely integrated with a consistent set of interfaces and vocabulary. In a world where much of this type of capability had been tied to some piece of hardware – hardware defined storage – IBM had securely unboxed storage and forever changed storage economics. In the last year, over 2,000 brand new clients have started with IBM Spectrum Storage. Through those conversations, we’ve learned two important things about how enterprises are approaching software defined storage – things that have led us to revolutionize how software defined storage is licensed. CFO’s are exasperated with the unpredictability of storage and storage software licensing. IT managers generally have a good feel for what type of capabilities they need to accomplish the use cases they want. But have you ever paused to think about how confusing it must be for them to figure out exactly how much software they need to license? Think about it from the perspective of someone not using IBM Spectrum Storage. …and the list can go on. If the IT manager can figure out how much of this stuff he wants at a given point in time, how is a CFO supposed to predict future costs? IT managers are dealing with transition in storage infrastructure. What software they need can shift rapidly. Most IT managers reading this post are responsible for estates of SAN storage. For the traditional workloads that our businesses are built on, this has been the dominant storage infrastructure approach for years. But there is a transition well underway. Who hasn’t been impacted by newer mobile and cloud workloads? What company or organization isn’t looking to make better use of Big Data and analytic workloads? These applications are being built to take advantage of a different kind of storage infrastructure, one that is characterized by direct-attach JBODs and fields of servers with lots of internal capacity, and really none of it connected to a SAN. IDC data suggests that IT managers are now purchasing more TB’s of this type of storage than they are SAN storage, and the trend isn’t likely to ever change. In many enterprises, the capacity mix is shifting from traditional SAN to newer storage-rich servers. The transition presents a challenge in storage software licensing. When physical infrastructure shifts from big SAN-attached storage systems to scale-out storage-rich servers, the types of capabilities needed don’t change dramatically, but the specific vendor software packages change a lot. Instead of a virtualizer for block SAN storage, an IT manager might need to shift toward offerings that software-define his field of storage-rich servers into something useful like performance optimized file storage for analytics, an integrated VMware block data store, or cost optimized object storage for backup and archive. This is all new and the rate of change is unknown – and that presents a challenge. Flexibility is paramount. 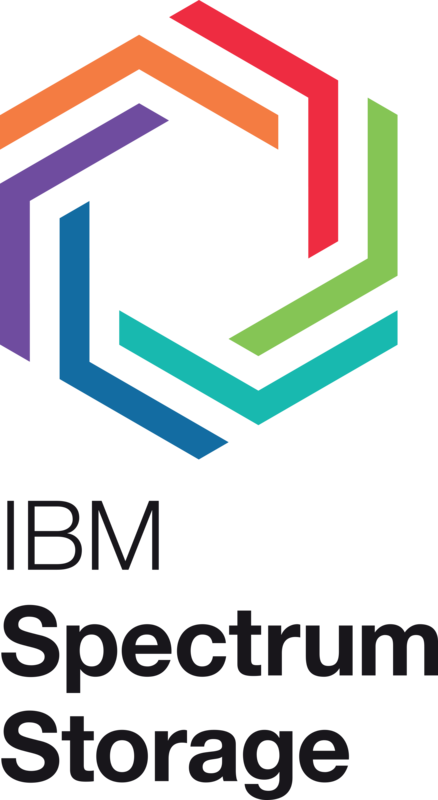 With IBM Spectrum Storage Suite, IT managers now have a simple and predictable licensing model for the entire IBM Spectrum Storage family. Its straightforward per-TB pricing relates costs to the amount of storage capacity being software-defined, regardless of use case. That makes it easy for IT managers to grow and transition how they use storage, and for CFOs to predict costs. And with the Suite, clients can save up to 40% compared with licensing all capabilities separately. Consider a typical enterprise starting with its existing SAN storage infrastructure but rapidly growing a new kind of infrastructure for new workloads. In most datacenters this transition is coming, but few really understand how fast or exactly which use cases will emerge. There’s going to be some experimentation and rapid change. Attempting to navigate the next few years using a’ la carte licenses of point products from multiple vendors is going to be difficult. In fact, CFO’s are going to push back against the unpredictability and may ration what software can be licensed. That can slow down innovation. IBM Spectrum Storage Suite offers cost predictability and frees IT managers to exploit any IBM Spectrum Storage capability required to get the job done. Let’s suppose you are an IT manager at the front end of this picture. 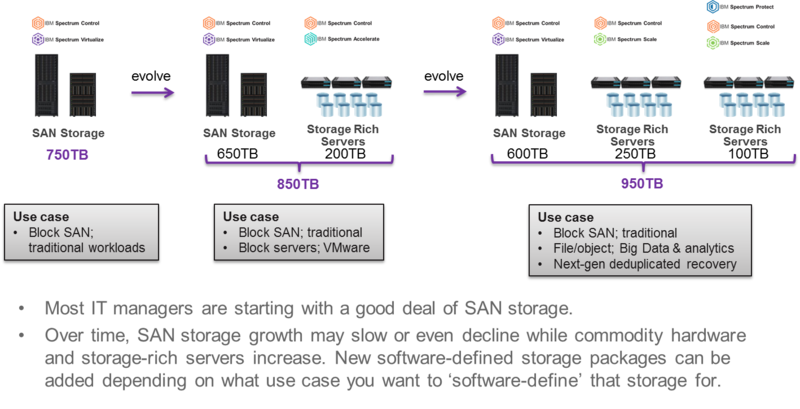 You’ve deployed Block SAN storage for traditional workloads as your first IBM Spectrum Storage Suite use case. Now you want to explore another use case. Well, with IBM Spectrum Storage Suite you already own entitlement to all capabilities in the IBM Spectrum Storage family, so you are free to download any of the software you like. To help you quickly adopt the additional use cases your business may need, IBM Spectrum Storage Suite licensing offers the ability to perform extended tests in an evaluation sandbox proving ground without additional charge. So go ahead, experiment with your next use case. Prove it, become familiar with it, pay for it when it’s deployed for productive use. This entry was posted in IBM Spectrum Storage, Software Defined Storage and tagged IBM, IBM Spectrum Storage, Software defined storage, Spectrum Accelerate, Spectrum Archive, Spectrum Control, Spectrum Protect, Spectrum Scale, Spectrum Virtualize. Bookmark the permalink.